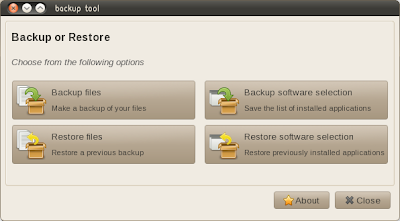 Linux Mint 9 comes with a completely rewritten MintBackup ("Backup Tool") - a great backup tool which is very easy to use. In case you don't know, Linux Mint is a disto based on Ubuntu which some characterize as "Ubuntu after a week of customizations". But what if you simply don't want to install Linux Mint and just want to use MintBackup in Ubuntu? Well, we've created a PPA for that so you can now easily install (and stay up to date) with MintBackup in Ubuntu Karmic, Lucid and Maverick (though we've only tested it in Lucid, but it should work in Karmic and Maverick too). But before installing MintBackup in Ubuntu, here's some more info on MintBackup: it can backup and restore files and directories (doh!) but not only that - it can also backup and restore your complete software selection (something you can also easily do via command line, but some are scared by the terminal) so you can install all the packages you had installed when you install a newer Ubuntu version. Since MintBackup is designed for non-geeks mostly, it can only do local backups so if you want something more advanced, I suggest you see what the WebUpd8 readers consider to be the best Linux backup tool. Once installed, you can access MintBackup via System > Administration > Backup Tool. And speaking of MintBackup - an application which comes by default in Linux Mint -, there's a question I've been asking myself for years: why doesn't Ubuntu come with a backup tool by default? Really now, it's a very important part of every Ubuntu installation (or it should be!) and yet there's no such default application. See also: Install MintMenu in Ubuntu from a PPA.